Acupuncture is one of the oldest, most commonly used medical procedures in the world. It originated in China more than 4,000 years ago. The theoretical basis of Classical & Traditional Chinese Medicine, has its roots in ancient Daoist philosophy. Through Daoist meditation practices, as well as astute observation of the body and the environment, the Daoist sages mapped the energetic pathways of the body, as well as the interaction between the body and the myriad influences found in nature. By studying nature they observed that the universe and all within it live under certain principles of constant change. When change is harmonious, balance is obtained. When there is no change or too much change, balance is lost and dis-ease can result. From its beginnings to modern day, the practice of acupuncture continues to change to meet the needs of the people. 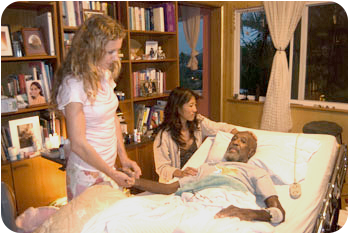 There are basic principles however that all schools of acupuncture hold as its core teachings. These teachings are found in the earliest known text the Neijing or The Yellow Emperor’s Classic discovered around 400BC. This text explains the natural effects of diet, lifestyle, emotions, environment, age and heredity as the reason dis-eases develop. The universe is composed of various forces and principles, such as Yin and Yang , Qi and the five elements (wood, water, fire, earth and metal). These forces can be understood via rational means and individuals can stay in balance or return to balance and health by understanding the laws of these natural forces. Each entity is a microcosm that mirrors the larger macrocosm. The principles of yin and yang, the five elements, the environmental factors of wind, damp, hot and cold, for example, which are part of the macrocosm, equally apply to the microcosm, which is the individual. There are 365 points and 14 major avenues, or meridians of energy that flow through the body. These meridians travel through the body from head to toe, as well as through the major organs. The energy that moves through the meridians is known as Qi (Chi). It is meant to flow smoothly and reach all aspects of the body down to the cellular level. When the flow is harmonious health flourishes. When the flow is disrupted, qi can stagnate and dis-ease will manifest. Acupuncture needles are sterile/ non-reusable needles that are gently placed at one or more of the 365 points along the meridians. These points are stimulated to send a message to the body to re-balance the qi and promote self-healing. Once a diagnosis is made a practitioner will utilize a variety of techniques. Treatments usually last an hour with needles inserted for approximately 20-30 minutes. The course and frequency of treatments depends on the severity of dis-ease.